Hard to believe the MX-5 is more than a quarter-century old. 27 years after the first Mazda MX-5 Miata rolled off the assembly line at the Ujina Plant No. 1 in Hiroshima, Japan, in April 1989, the one-millionth example of that iconic roadster has just been built. On April 22, to be exact. 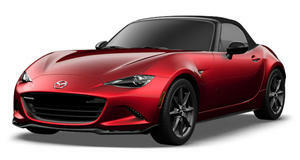 And starting on May 3, at the Hiroshima Flower Festival, that one-millionth MX-5 will go on display for the first time. It will later be shown at the Goodwood Festival of Speed in the UK on June 26, and will continue its European tour from there. The world first saw the MX-5 Miata at the 1989 Chicago Auto Show. The second gen roadster was revealed in 1997 at the Tokyo Motor Show and in May 2000 it was recognized by Guinness World Records as the world’s best-selling two-seater sports car, with just over half a million examples built at the time. The latest (fourth) generation MX-5 was unveiled in September 2014 and the latest version, the wicked cool MX-5 RF, was first shown last month at New York. One million MX-5s produced (and counting). That’s an insane number considering it’s a niche car that pays tribute to the British roadsters of yesteryear.